Tune has been developed by Jigsaw, a subsidiary of Alphabet Google Is Now Part Of...Alphabet? What You Need To Know Google Is Now Part Of...Alphabet? What You Need To Know Google, the Internet giant, is turning into Alphabet. Here's what that means for you. Read More . 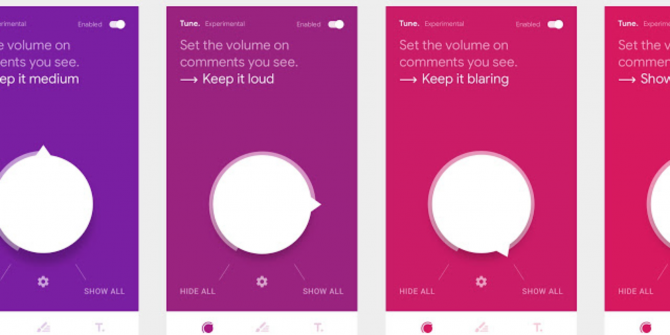 Tune leverages Perspective, which “uses machine learning to spot abusive language”. Because online comments aren’t generally filled with people expressing love for their fellow human beings. It should be noted that Tune cannot combat the targeted harassment of individuals Online Harassment Is Your Fault; Here's How To Fix It Online Harassment Is Your Fault; Here's How To Fix It What happens to harassment victims who aren't good at interacting with the press, or do or say unpopular things? Read More , which is another issue altogether. However, by helping make the most toxic comments less visible, Tune could help deter the trolls who get a kick out of ruining someone’s day. Explore more about: Browser Extensions, Google Chrome, Online Commenting. And who decides what is a "toxic comment"? We are raising a snowflake generation who are triggered by words on their screen. If you don't like the comment, respond in a sane way, or move on. Tune is great for setting up an echo chamber by tuning out any comments that do not agree with your POV.